The What's In My Bag? Tags have always been my favorite posts to read or my favorite videos to watch on youtube. I don't even know why, I just find it interest seeing what people carry around with them every day. It's crazy what us girls carry around daily. No wonder we get asked if we have bricks in them! They are really heavy. 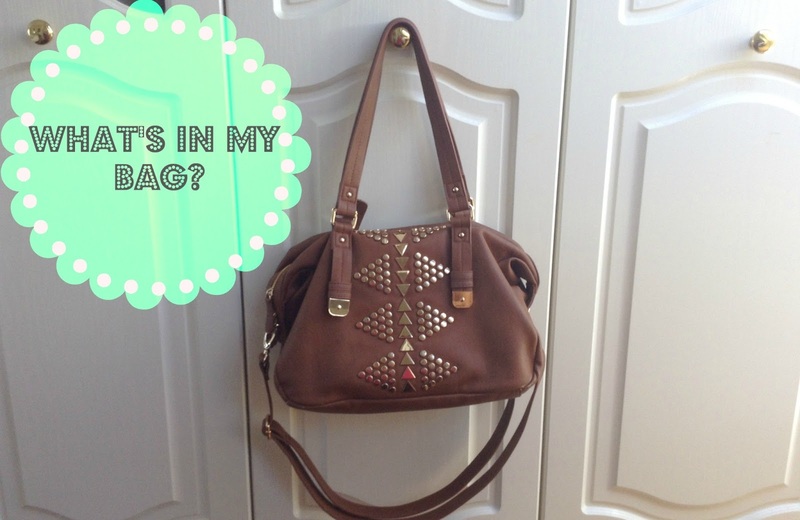 My bag is from Topshop is the studded holdall and was £40.00. I had my eye on this bag ever since I saw it in Zoella's What's In My Bag video. But I did think the price was a bit steep however I love this bag. It's not to big but also not that small. You are able to fit in all your essential into it. I don't think it is available on the website anymore though. I've tried to look so that I could link it at the end of this post but I was unable to find it. Make Up Bag - This was actually a free gift when I bought Company magazine. It is quite small but fits all my make that I use every day. It's useful if I want to touch up on the go. Sleek Au Natural Shadow Palette - Definitely one of my favorite make up items to use at the moment, I just how natural they look and how well the colors blend together. It also has a huge mirror on the inside of the lid which is why I carry it in my bag. Umbrella. I live in the UK so no matter what time of the year it is an umbrella is one of the most essential things to carry around. Bottle of water - I love to be hydrated throughout the day. I also find carrying around a bottle of water is a great way to avoid buying those sugary, unhealthy fizzy drinks as well. Healthy AND saves money. Win Win. Deodorant - One of the most important things to carry around for this time of the year. If you live in London and take public transport a lot like me there are a lot of unhygienic people about. It's best to not be one of them. Headphones - I cannot travel without music. It's like my air. I need it to survive. Obviously I use this with my iPhone or iPod which I also keep in my bag but are not pictured. Lip Products - I tend to carry a lot of lip products with me, some just to moisturize, some to add color. I make sure I have options and tend to use whatever I am in the mood for. Sunglasses - Yes I carry these and an umbrella with me. Judge all you want. When you live in the UK the weather is seriously unpredictable. These are nothing fancy, just a cheap pair of sunglasses that I found in my mum's drawer. I love them though. Mini Journal - I use this to write quotes and positive and inspiring says that I hear when I am out and about. It just helps me have a more positive outlook on life especially as I tend to be quite a negative person. Charlie Pink Body Spray - Again another important thing to carry around. Helps keep you smelling nice throughout the day. Owl Coin Purse - I use this to store all my loose change rather than put them in my wallet as it just makes it easier when shopping and if you're buying things than don't involve using your card or notes. Tangle Tamer Brush - I found this in Boots and I actually prefer it compared to the tangle teezer it just works better on my hair and if you're like me and have long hair you tend to brush your hair a lot throughout the day. I find the bristles a lot stronger on the tamer than the teezer as well. Pink Purse - I use this purse for all my cards and for my cash as well it is a nice size and contains 10 slots. It still isn't enough for all my cards though. The amount of store cards in my purse are actually ridiculous. Do you carry this much or more in your bag? What are you hand bag essentials? Is there anything here you think isn't that essential? Leave a comment below. If you have already done a post or video like this then leave the links below and I will check them out as well. I love this post & your coin purse! Wow you have a lot of things in your bag, nice list!